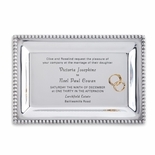 Beautifully engraved with the text of a wedding or anniversary invitation or birth announcement, this polished pewter tray will be a treasured gift. The rich border is in the rococo style fashionable in Jefferson�s youth. 9" x 6". Made in the USA. Email or mail us a copy of the invitation or announcement, up to 13 lines, and we�ll do the rest. 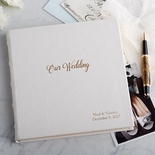 Please reference your order number on the invitation/announcement when mailing. Allow 3-4 weeks for delivery. Express shipping is not available. 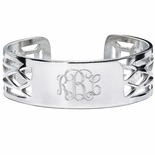 Pewter is a bright, shiny metal similar in appearance to silver, consisting of an alloy composed of tin with various amounts of copper, zinc, and bismuth. The history of pewter in America goes back to the early colonial period. Spoons and buttons made of pewter are thought to have been made as early as 1610 in Jamestown. Prior to the American Revolution, colonial pewterers primarily repaired damaged pewter goods from Europe, or created new pieces by melting down existing pewter, and casting objects in brass molds. Owing to an innovation around 1800, pewter formulation was improved with the alloy antimony, to create a type of pewter known as britannia. Britannia had a much brighter silver appearance and the finished objects were more durable, which helped to preserve pewter�s popularity despite the trend toward fashionable ceramic wares in the early nineteenth century. Jefferson�s dining room at Monticello would have featured fine silver tableware items, while pewter or britannia was probably used in Monticello�s dependencies (such as the kitchen and cook's room), and on Mulberry Row (the site of light plantation industry and slave dwellings), since by the early nineteenth century pewter objects were considered to be more utilitarian than formal. Inventories of Monticello�s kitchen list items made of pewter, such as water plates (for keeping foods warm) and plates of various sizes. Please allow 3-4 weeks for delivery. Express shipping is not avialable.